There are a number of ways to restore teeth that are damaged, diseased, or decayed. The advances in modern dental materials and techniques allow us to provide you with natural-looking restorations that are both strong and durable. Our goal is to provide you with options for the best type of restoration. Early detection is important to help you keep your teeth. During your initial visit to our office, Dr. Burba will perform a complete examination of your mouth and a full set of x-rays will be taken to evaluate your needs. Dental amalgam is made by combining mercury, silver, zinc, copper, and possibly other metals. 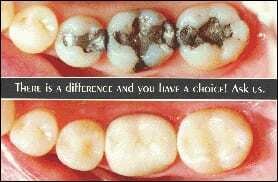 Amalgam has several disadvantages when compared with tooth-colored fillings. Silver amalgam fillings do not bond to tooth structure; therefore, more tooth structure is usually removed to keep a silver filling in place. They can leak and cause a new cavity underneath the filling. These fillings last about seven years and should be checked during your hygiene visits. Besides these reasons, they are dark, noticeable, and unattractive. We don’t do these anymore because there are better options. Now you have a better option to restore your tooth back to health: Tooth-colored fillings or composites. These fillings have many advantages. They physically and chemically bond to the tooth, which reinforces it. They bond weakened parts of the tooth back together so more of your tooth can be saved. When done properly they don’t leak like the silver fillings so you get less new decay underneath. Composites seal into the pores of your tooth, so there is virtually no sensitivity to cold or hot afterward. They also look much more natural. You won’t be able to tell where they are when Dr. Burba is done. Inlays are fillings made in a dental laboratory and then cemented into your tooth. They can be made of several types of materials, including porcelain and gold. This type of filling takes two visits to finish. At the first visit, Dr. Burba prepares the tooth and makes a mold or impression of your tooth. A temporary filling is then placed to hold the space and protect your tooth. At the second visit, the permanent filling is bonded in. These inlays are extremely strong and durable, which means they can last many years. Because they are tooth-colored, they blend in so well that you can’t see them at all. If you’re in need of a filling you may click here to request an appointment online or you may call our office to schedule one directly with our receptionist.